(MP075). W L Wyllie (1851-1931). On canvas or on heavy paper. One of the definitive paintings of the battle and known throughout the world, William Lionel Wyllie’s “Trafalgar, 2.30 pm”, an oil on canvas measuring 9 x 5 feet (3.54 x 1.96 m) and showing HMS VICTORY at the very centre of the action belongs to, and hangs in, Britannia Royal Naval College, Dartmouth (BRNC) in Devon, England where it has been since the early 1960s. As directed by BRNC, Maritime Prints undertook in 2005 to produce a limited edition run on canvas and card, the total together restricted to a maximum of 750 copies worldwide. The copying of this famous oil painting was undertaken not only with the greatest care, but with trepidation - the sheer breadth of colour in this canvas demanded meticulous attention to photographic lighting and subsequent proofing: and there would be a worldwide audience of critics were we to fail! The canvas copies are printed by a refinement of the the giclee method and are supplied varnished by hand and either stretched on a wooden frame/former and ready in all respects for fitting to a frame; or merely rolled. Their size is very variable and can range from 27 x 14.5 ins (68.5 x 37 cms approx) (the Standard size) to a maximum of 74 x 40 ins (188 x 101.6 cms) approx if you have the space! The prices start at £115 +VAT for the Standard size which includes the stretching. Or it is £90 +VAT unstretched and rolled in a cardboard tube for ease of postage. Larger sizes are more expensive: tell me what wall space you have available and I'll quote you accordingly. Those on card are printed by lithographic offset. They can be purchased either mounted (”matted” in US parlance); or simply rolled for ease of postage. The mounted ones are supplied in a plain heavy weight mount (matt) with wash and lines and, as with the canvas versions, can be sized according to your specifications up to a maximum of 74 x 40 ins (188 x 101.6 cms) approx. The 27 x 14.5 ins version (Standard size) is £105 +VAT (mounted) or £70 + VAT (unmounted and rolled in a tube). I would be delighted to quote for different sizes. With both versions (canvas and card) a beautifully printed pencil drawing of the scene (measuring 11 x 9 ins, 28 x 22.8 cms) shows the disposition of the ships and gives all their names: at the top of the card is an engraved admiral's flag, the cross of St George which HMS VICTORY wore that day, 21st October 1805. 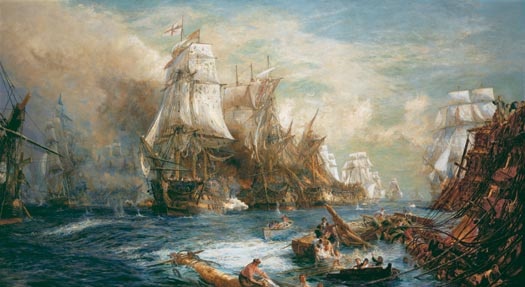 The names, reading from left to right, are forever associated with this historic battle: NEPTUNE, BELLEISLE, EURYALUS, ROYAL SOVEREIGN, SANTA ANA, VICTORY, FOUGUEUX, TEMERAIRE, REDOUTABLE, THUNDERER, DEFENCE, PRINCE, PICKLE, BRITANNIA, LEVIATHAN, BUCENTAURE, SANTISIMA TRINIDAD... Wyllie has portrayed the scene with customary skill and the overall effect is quite superb. This canvas deserves its place as the world's most iconic depiction of the Battle of Trafalgar.